I'm sure you remember that one of my Q1 Finish Along goals was to make Elvis a new dressing gown out of an old one of mine. 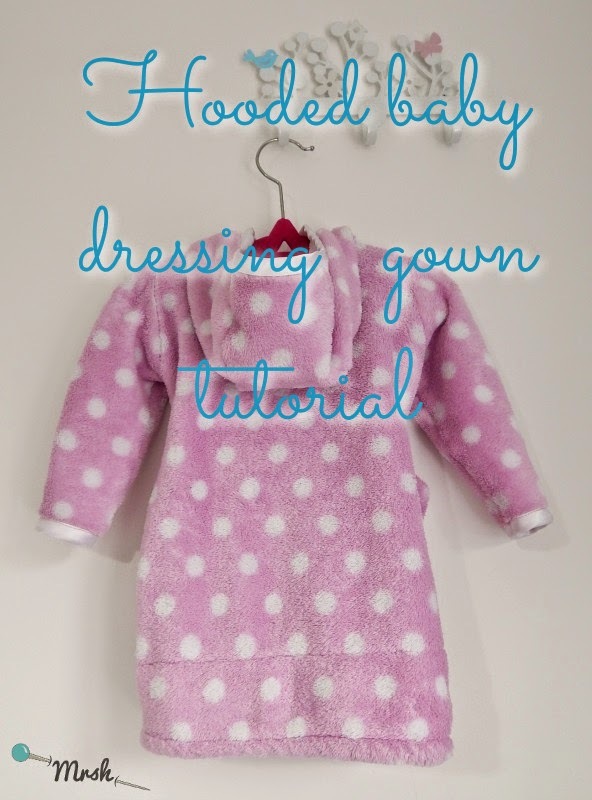 Well I did make that dressing gown, and I took photos along the way so that you can make one too. 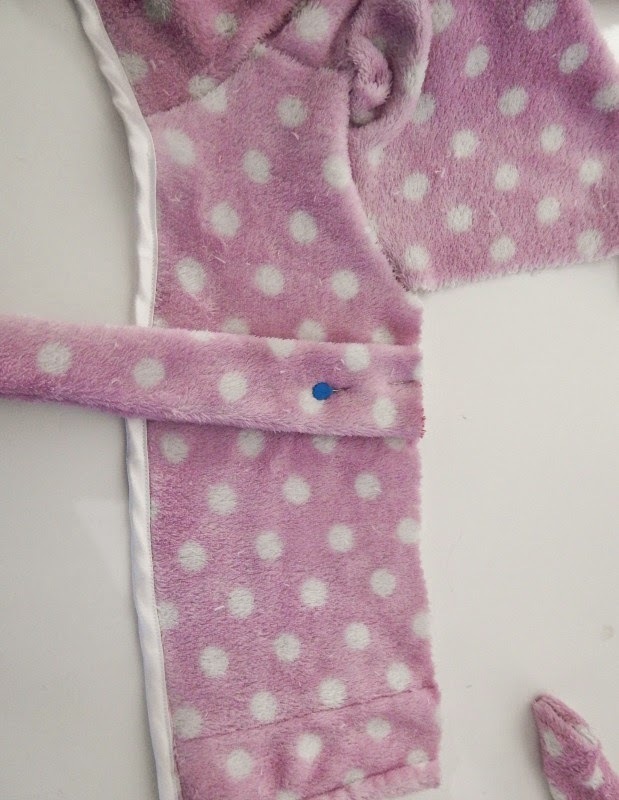 The template pieces are only 0-6m, but you can easily increase them using a t shirt that fits your baby well, just add a bit extra so that it's not t-shirt tight. 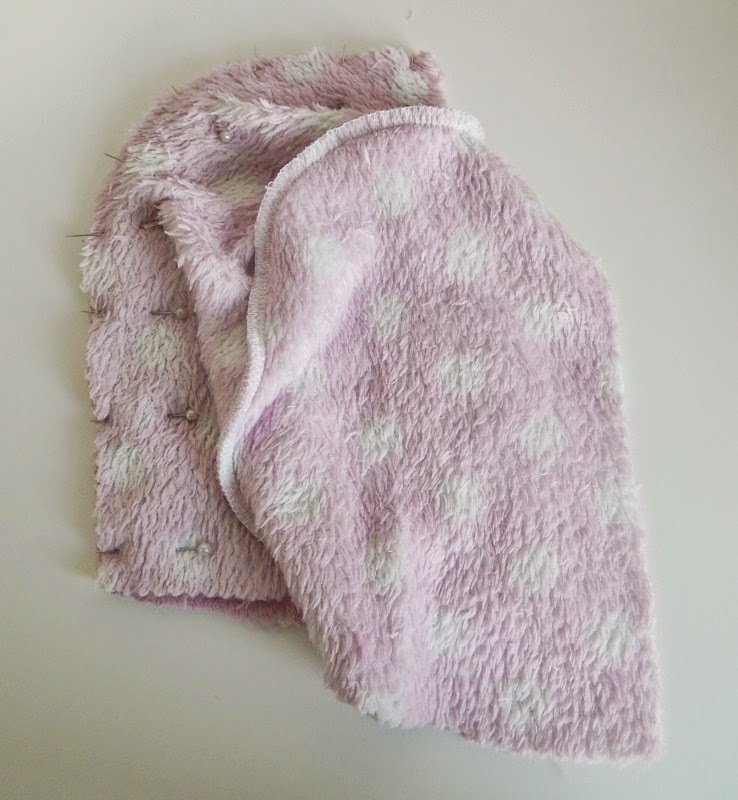 You will also need to cut one hood centre 10.5" x 4" (the width will depend on how bulbous your baby's head is) and two waist ties, approximately 15" x 4". 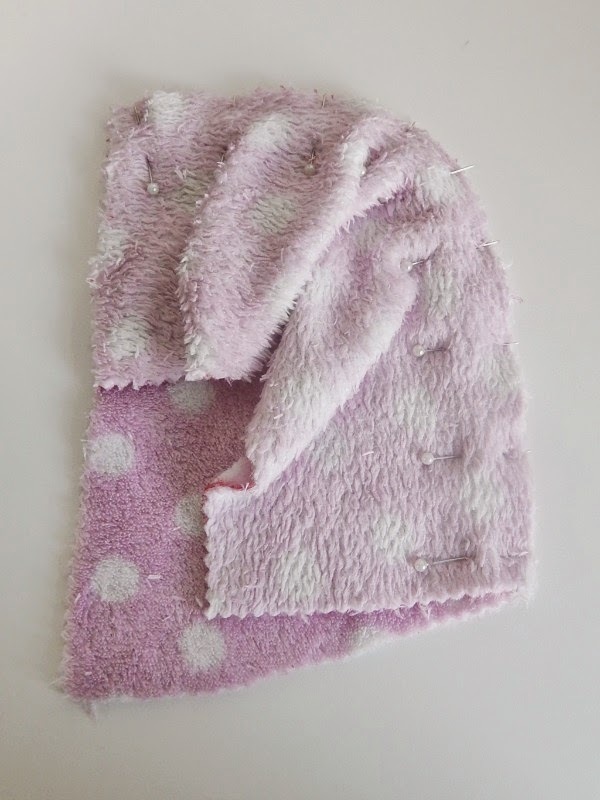 You will need around 14" of binding for the sleeves, and anywhere from 50" - 80" of binding for the front, depending on how much you extended the bodice pattern to suit your baby. 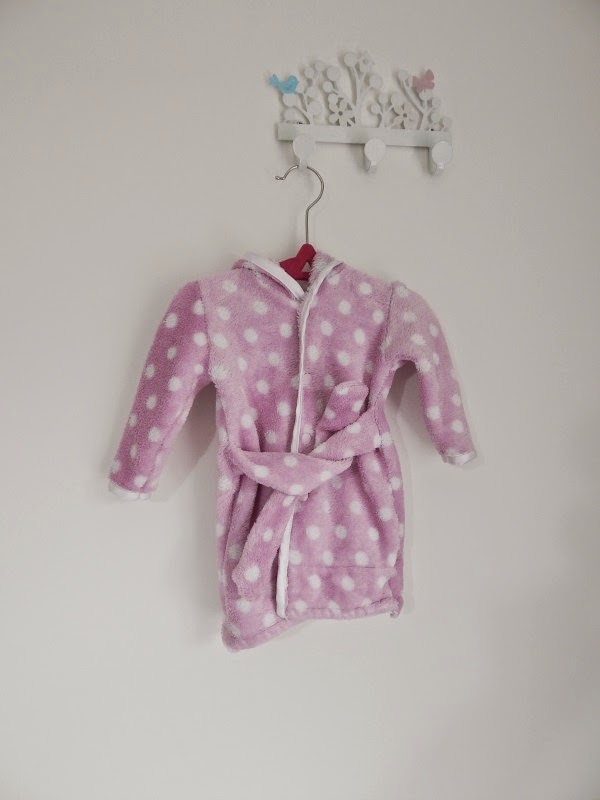 You will also need 4 KAM snaps, or some small pieces of velcro depending on how you would like to secure the dressing gown closed. Begin by attaching the hood centre to one half of the hood pieces, right sides together along the curved edge. Next bind the short edge of the sleeve pieces. 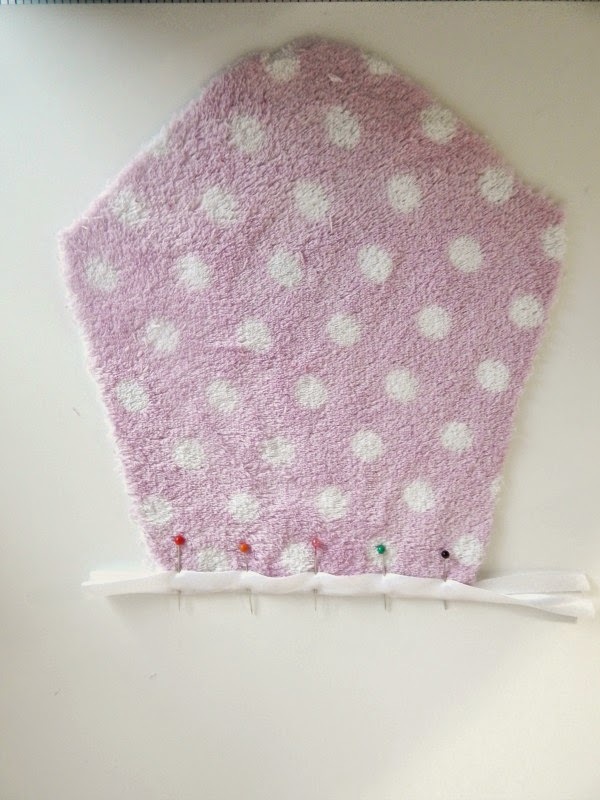 Pin the binding to the wrong side and stitch along the first open fold line. Then flip the binding over to the right side and stitch along the open edge. Stitch the two front bodice pieces to the back bodice along the shoulders. I modified the pattern to have a front 'v' after this photo was taken. Open out the bodice flat, then find the centre of the sleeve piece and pin it to the shoulder seam, right sides together. 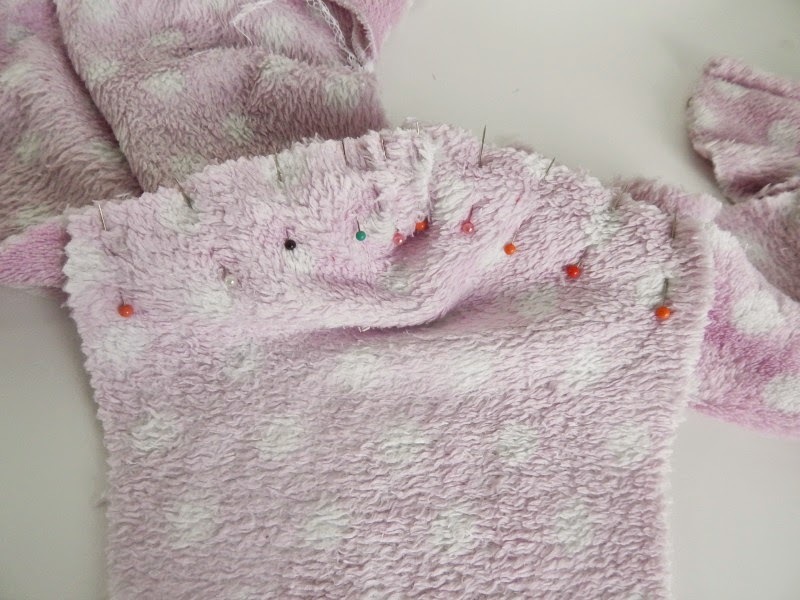 Ease the sleeve into the arm hole, pinning as you go. I added a pleat at the centre to help it fit. 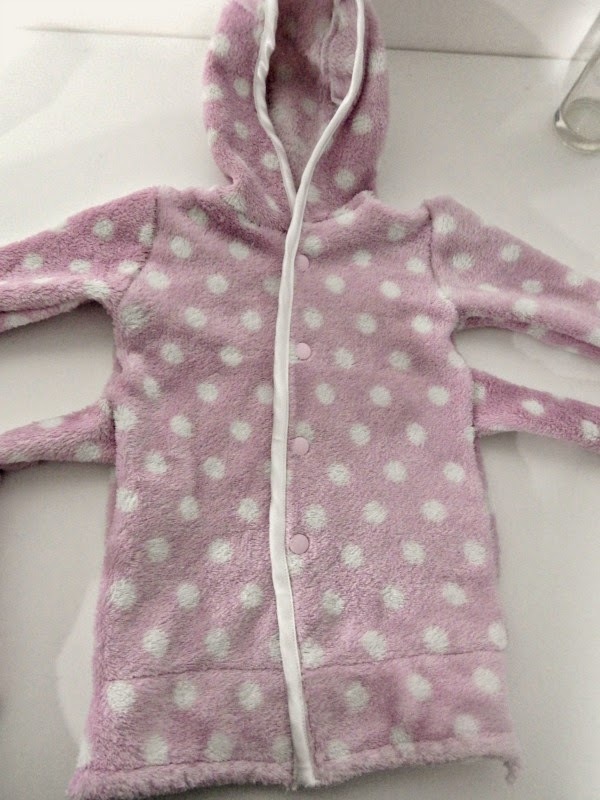 Then pin the hood to the front neckline. You will need to pleat the centre piece to fit. The size of your pleats will depend on the size of the centre hood piece. I chose two smaller pleats along the seam lines to accommodate the size of Elvis' head. 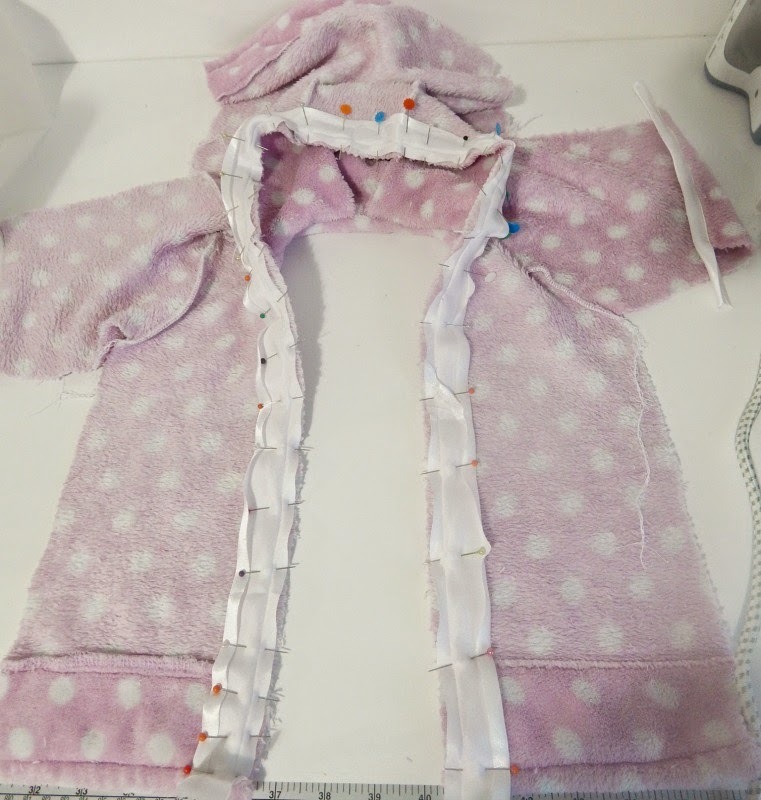 Once the hood is attached, pin and stitch the binding along the front and around the front of the hood, back down to the hem on the other side, on the wrong side of the dressing gown. 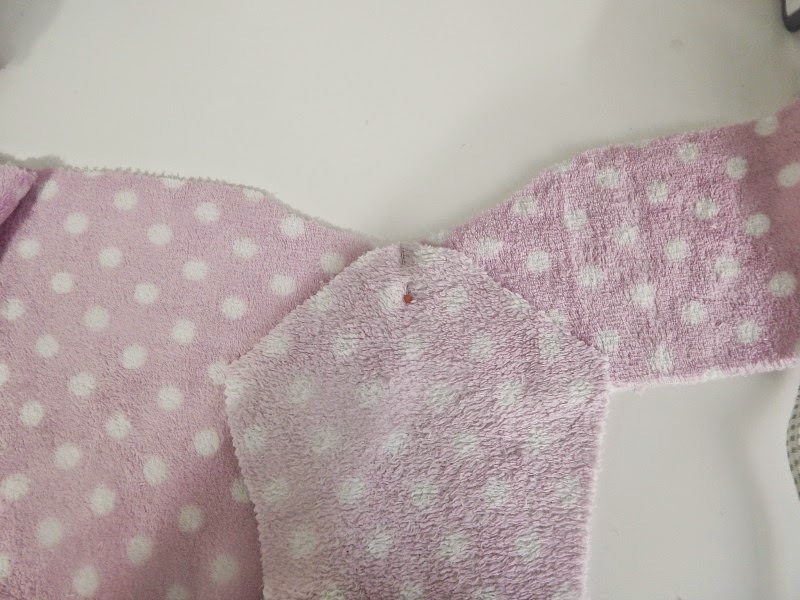 Flip the binding to the right side and stitch it down all the way around. 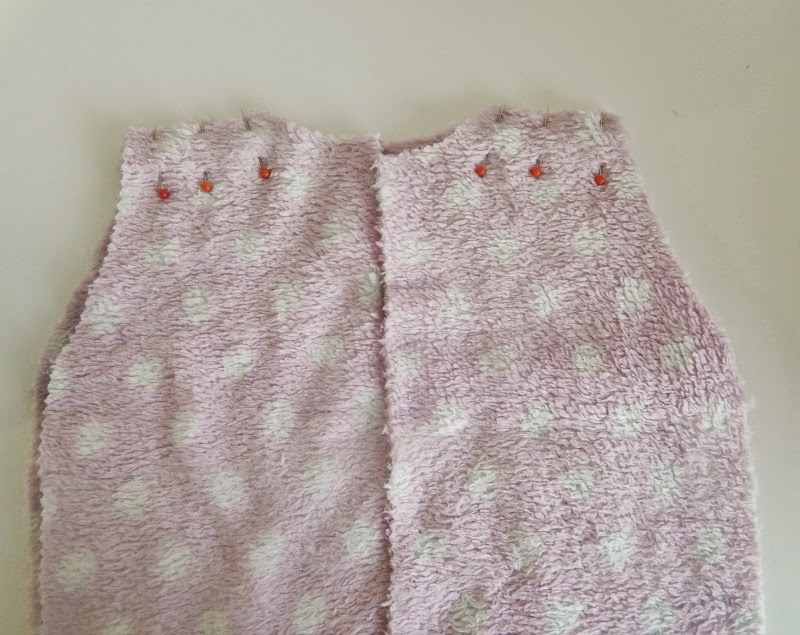 If your bodice parts were already hemmed (if you cut them on the hem of an old dressing gown as I did) then you will want to turn up the raw end of the binding and stitch into place. 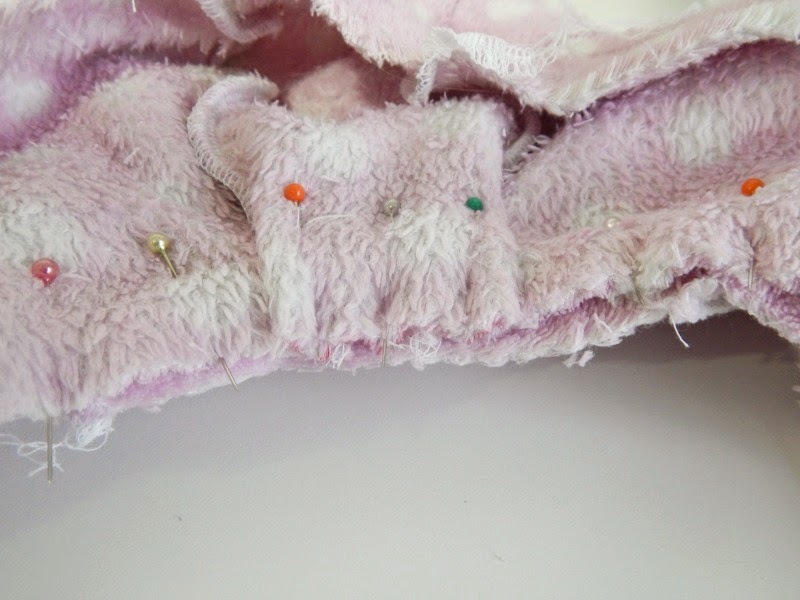 Sew the two waist ties in half lengthwise leaving one short end open, and turn them right side out. 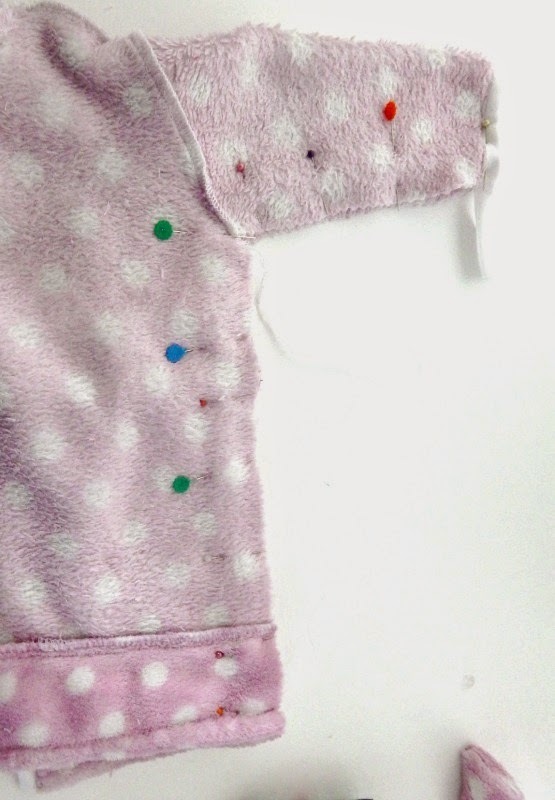 Stitch them to the side of the front bodice within the seam allowance approximately 2" (5cm) below the sleeve. 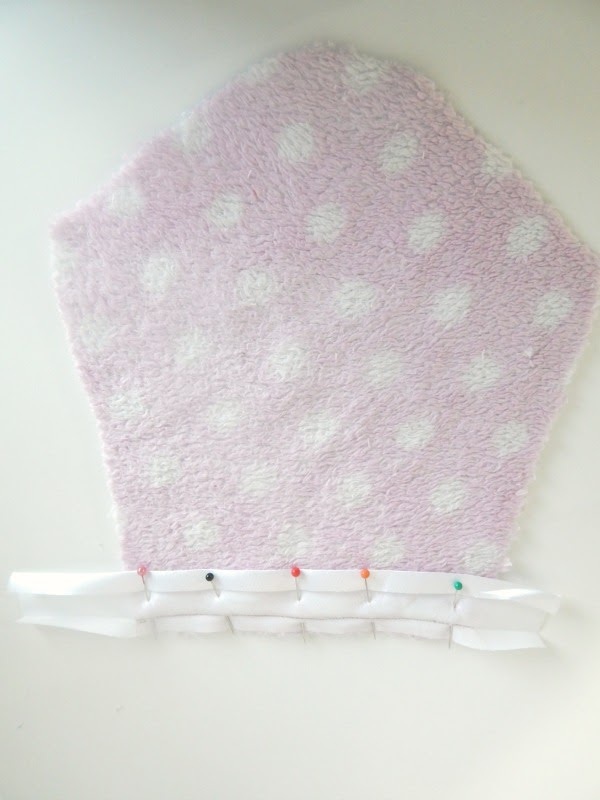 Match the sides and arms and then stitch them in one go. 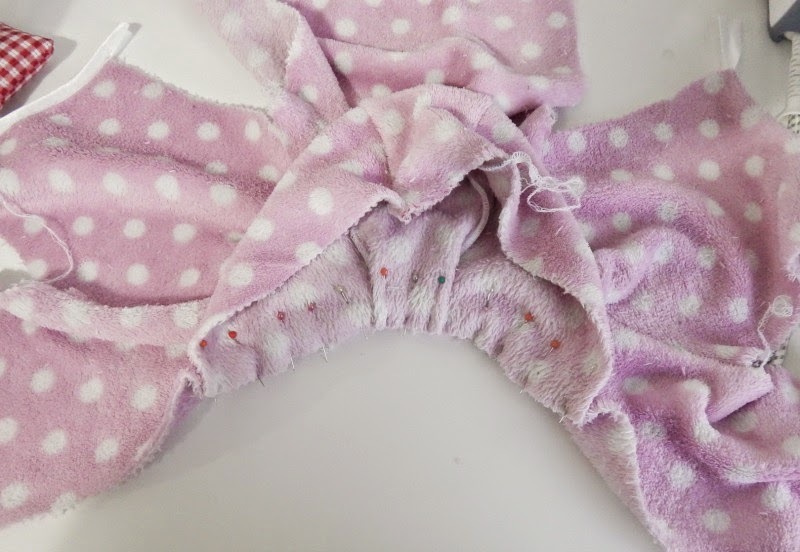 If your dressing gown is not already hemmed, turn up a 1" hem all around and stitch into place, securing the raw edge of the binding as you go. Add snaps or Velcro to the front as you prefer. I used KAM snaps in baby pink. 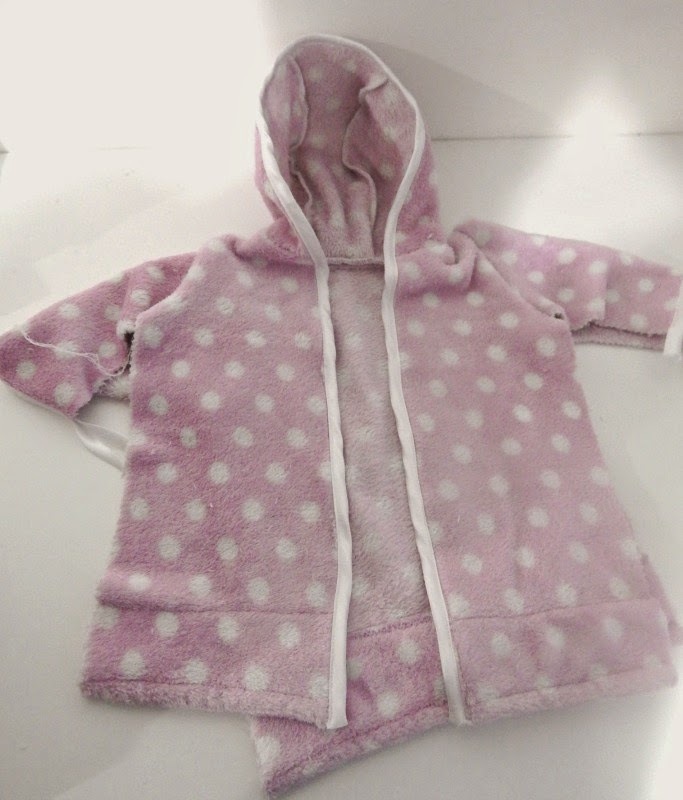 All that's left is to pop it on your baby and snuggle cosily! I'm linking up to the Finish Along Q1 with On the Windy Side while I try to decide what my Q2 goals will be! Have you started thinking about your Q2 goals yet?